I first learned of Free Green when they published three tiny house plans. At 1,160 square feet this latest plan is not tiny but is a very nice example of their work so I wanted to share it with you. If this Modern Cabin is too big for you be sure to check out their smaller Tiny House Plans. 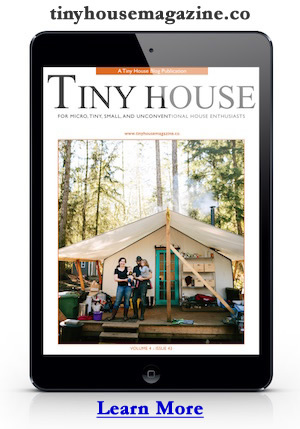 Currently they have three tiny house styles at 525 square feet. What I like most about Free Green’s plans is the high quality and low cost. Often you’ll find stock house plans of this quality costing several hundred dollars (or more). Free Green has a different business model and offers a subscription service that allows you to download multiple plans for the same flat annual fee. This lets buyers get a close look at what they are hoping to build and doesn’t cost them more money for downloading several different plans. They have three membership levels, Free, Premium ($49,95/year), and Premium+ ($199.95/year). The difference has to do with the groups of plans you can download and the types of files. For example the most expensive plan gives you access to the editable CAD files. I signed up for the Premium plan because I wanted to see the tiny house plans up close. I was blown away by the high quality of the plans… and this is NOT a paid endorsement… in case you were wondering. I just like giving credit where credit is due and these folks have earned it by challenging the ‘normal’ business model for stock house plans. I hope more designers will begin to realize that by making good design available to more people not only continues to be a sound business model but is good for our human community in general. Most do-it-yourselfers who dream of building a tiny house themselves will find that the free plans and ebook I offer on Tiny House Design adequate and flexible for building their dream tiny house; but if you are looking to have a green home professionally built you will definitely want to check out Free Green before plopping down any of you money for other stock plans. Below are some images of this 1,160 square foot Modern Cabin. This entry was posted in Plans and tagged cabin, free green, green, modern, modern cabin, sustainable architecture. thanks alot.wishing u the best! I THINK THE CABIN IS GOOD LOOKING BUT I WOULD NEED TO BE ABOUT 400 SQUARE FEET AND ADA BECAUSE I AM DISABLED.